6. In Spring 2017, the number grew to four interns who are supervised by staff in Student Involvement and Leadership Development and funded by the generous support of university donors. Through this opportunity, these NIU students have gained practical experience and skills in with marketing, logistics, and fundraising within in a non-profit setting. Richard Arnold, the Outreach and Education intern, is a sophomore marketing major who focuses on creating marketing campaigns, expanding the Huskie Food Pantry social media presence, organizing public speaking events and identifying various supplementary services that can be provided to clients during pantry nights. 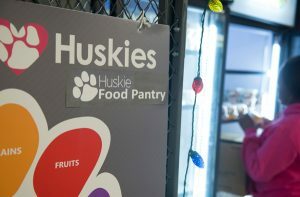 He is proud of the growth of the pantry and the connections it has made on campus with students and within the community. Candy Melara, the Operations and Volunteer Coordinator Intern, is responsible for managing the volunteers who serve at the pantry as well as overseeing the evening operations during pantry hours. Melara is a junior studying Community Leadership and Civic Engagement. Overall, Melara has seen tremendous growth in the number of individuals the pantry has been able to aid and is excited for the continued educational opportunities the pantry can provide to NIU students. The Development Intern, Kylie Moran, focuses on securing funds through grant writing and event coordination for the Huskie Food Pantry. Moran is a junior majoring Nonprofit and Non-governmental organization studies. Her position has pushed her to be detail-oriented and creative. She has seen the pantry become more space efficient in her time working there, and in turn this has allowed more students to use the pantry and has improved the overall flow of the pantry as well. Sam Wrzesinski, the first Huskie Food Pantry intern, is a senior studying Family and Child Studies with an emphasis in Family Social Services. Wrzesinski has been with the pantry since August, and said she has seen an abundance of growth in the products the pantry carries. She notes the pantry started out with mostly dried foods and canned goods, and now offers a variety of options including fresh produce, gluten-free items, vegan items and specialty items. Wrzesinski has seen immense growth in the pantry and knows that it will continue to grow with time.